The War Memorial commemorates those who served in World War One. The memorial was unveiled by Sir George Fuller on the 6th December 1919. The memorial is a turned marble stone column surmounted by a bust of an Australian soldier, all supported on a sandstone plinth. 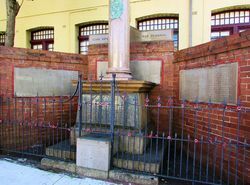 Name plaques are attached to both the plinth and surrounding brick walls. An Australian Imperial Force (A.I.F.) badge with crossed staffs adorns the column. In 1914, when the nation was called on to defend England, Glebe School resorted to practical patriotism with its war relief schemes, fund raising, making comforts for the Red Cross and continuation of school cadets. Between 1914 and 1918 some 306 former pupils of Glebe School volunteered to the call of King and Country and crossed the seas to foreign lands. More than fifty former Glebe School students died at Gallipoli, in France and in the Middle East. Yesterday afternoon, in the presence of a large assemblage of Glebe residents and parents and past and present scholars of the Glebe Public School, Mr. P. Keegan, M.L.A., laid the toundation-stone of a war memorial, funds for which have mainly been found by the children of the school, the Citizens and Parents' Association, and others. Alderman F. E. Munro (Mayor of Glebe) presided. Mr. Keegan drew attention to the fact that the names of over 500 old boys of the school who had answered the call of would be inscribed on the memorial. To the strains of the Last Post, a child from each class placed a wreath on the foundation-stone, which, through the generosity of Messrs. Garnett and Chambers, contractors, had been prepared free of cost. The Eastern Suburbs United Band played during the ceremony. Sunday Times (Sydney), 19 October 1919. It is estimated that not fewer than 500 old boys of the Glebe Superior Public School fell in the war (sic). To perpetuate their memory the children attending the school have contributed funds for the erection of a memorial, which was yesterday unveiled by Sir George Fuller. 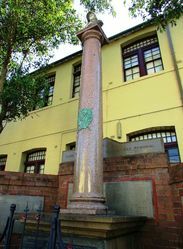 The memorial, which is in the form of a polish granite column resting on a trachyte base, and surmounted by a mid size bust of an Australian soldier, executed in white Carara marble, occupies a prominent position in front of the school buildings. The names of the heroes whose memory it is intended to perpetuate, will be inscribed on a wall to be built at the rear of the base. The headmaster, Mr. Herlihy, stated that the funds to defray the cost of the memorial were subscribed by the boys attending the school, augmented by contributors from the school funds, and assisted by the efforts of the girls. The complete cost will be about £300. The memorial was designed, free of charge, by Mr. W. Martin, architect.